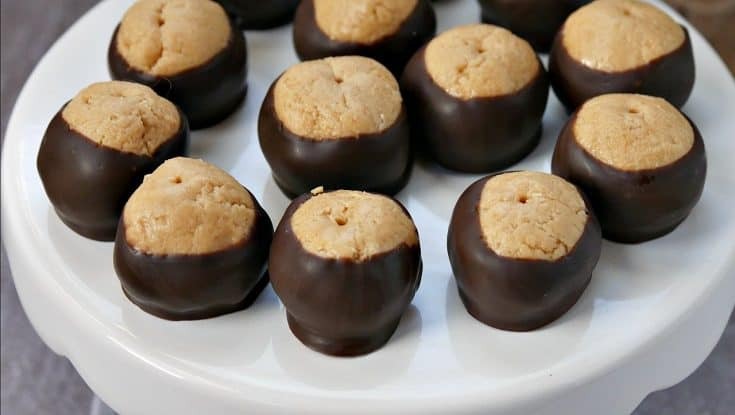 Perfect for a last minute treat, this buckeye candy recipe is easy to make with just a few simple ingredients including peanut butter from our sponsor, Skippy. 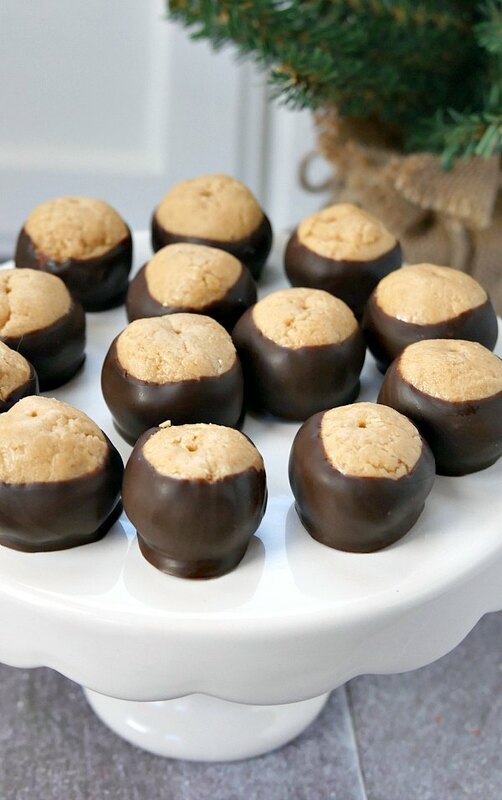 Buckeyes are one of my all time favorite Christmas candies. I've wanted to try my hand at making a batch, but never made the time for it. Last week my sister's boyfriend gave me a blank look when I asked him if he liked Buckeyes. Both he and my husband grew up in the northeast and apparently buckeye candy is a Midwest treat. So I had to make a batch for him to try at Christmas dinner. The best part about buckeye candy is the peanut butter. 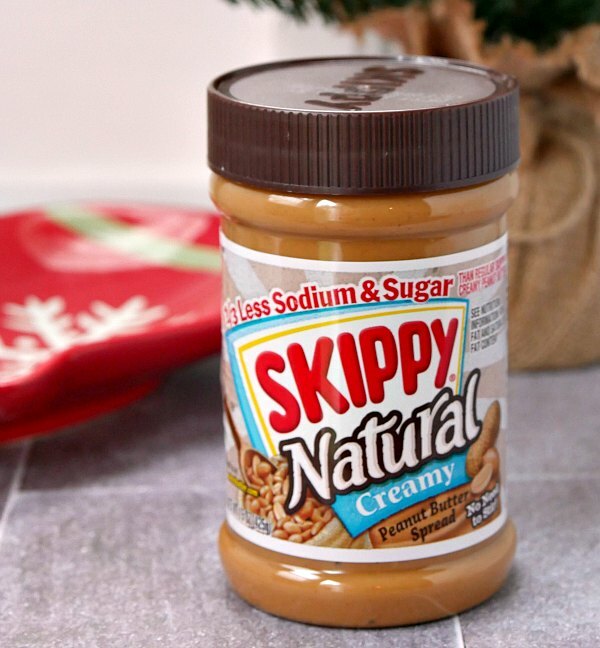 I used Skippy Natural creamy with 1/3 less sodium and sugar. The ingredient list is super short, which I love. No unnecessary ingredients! I went with less sugar since I was adding powdered sugar in the recipe. 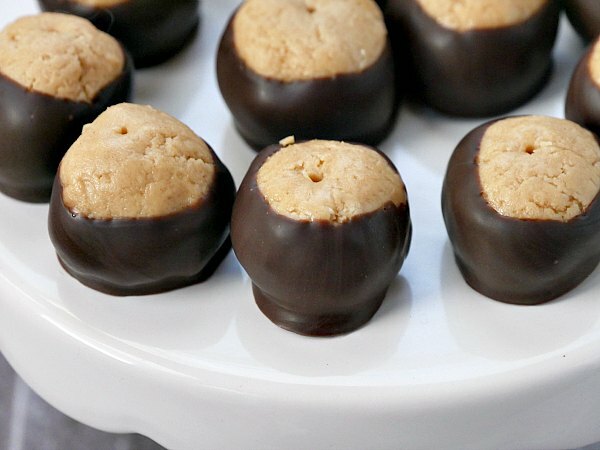 I read a few recipes for buckeyes and they all seem to have the same basic ingredients – peanut butter, powdered sugar and butter for the center. The biggest difference I noted was in the chocolate. A lot of recipes call for paraffin wax to get the chocolate to set up. 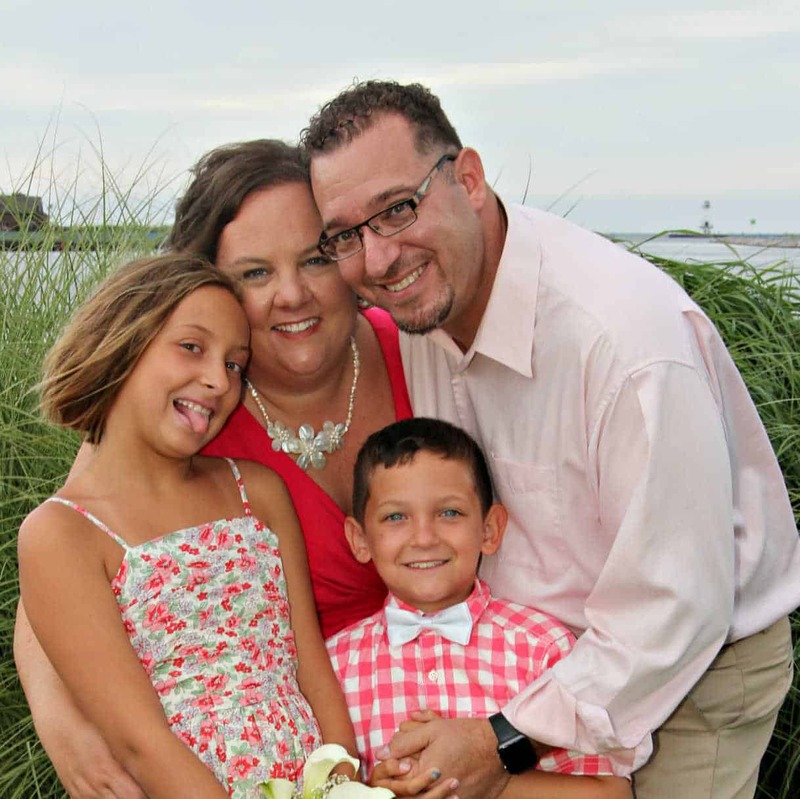 I was pretty certain that paraffin isn't a necessity, though and I set out to find out. I used a small cookie scoop to make the balls even in size. Every recipe I read said to stick a toothpick in the peanut butter balls before freezing them so I did that. It worked great! I didn't bother smoothing over the holes after dipping them in chocolate, though. But you can if the hole bothers you. To get the chocolate to set up quickly, I made sure the peanut balls were frozen well. I left them in the freezer for at least an hour. Then, I used the cold cookie sheet to place the chocolate dipped balls on. Between the cold of the frozen peanut butter balls and the cold of the cookie sheet, the chocolate didn't even need to go back in the freezer. It set up in a matter of a few minutes right on the counter. I also think that using the Wilton melting chocolate wafers helped as well. They tend to set up nicely when melted and used as a dip. I also kept the melted chocolate warm in my Wilton chocolate melting pot – which I love! It's worth the money to keep chocolate melted nicely when dipping. 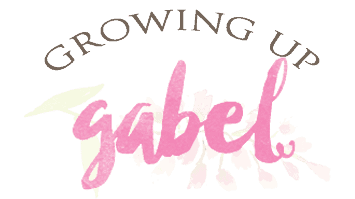 I couldn't believe how quick and easy these were to make. Skippy has a dark chocolate natural peanut butter that I think would make a fun double chocolate buckeye candy recipe. 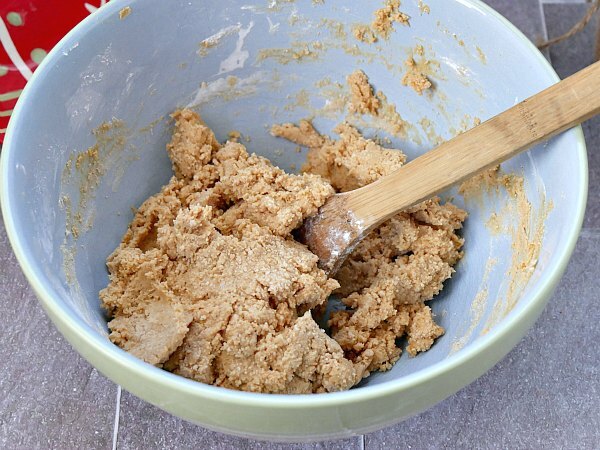 Stir together butter and peanut butter in a medium mixing bowl. I used a wooden spoon. Stir in powdered sugar and vanilla until the ingredients are combined in to a stiff, coarse dough. 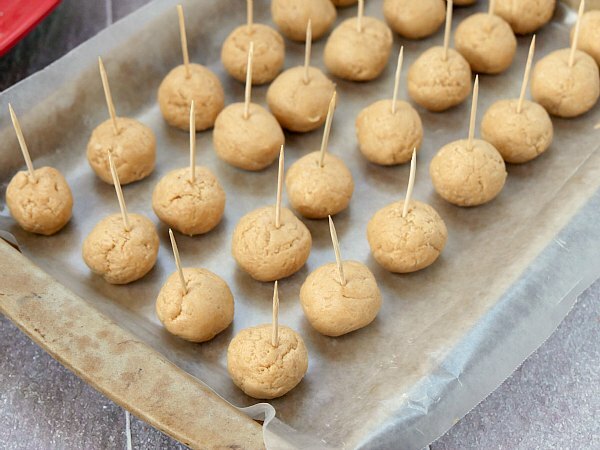 Use a small cookie scoop to make balls with the peanut butter mix. Drop balls on to a wax paper lined cookie sheet. Stick a toothpick in to each ball. Once all the dough has been scooped, stick the cookie sheet in the freezer for an hour. After an hour, melt chocolate chips in a Wilton chocolate melting pot. Add a teaspoon of palm shortening, if desired (I'm not convinced this is necessary). 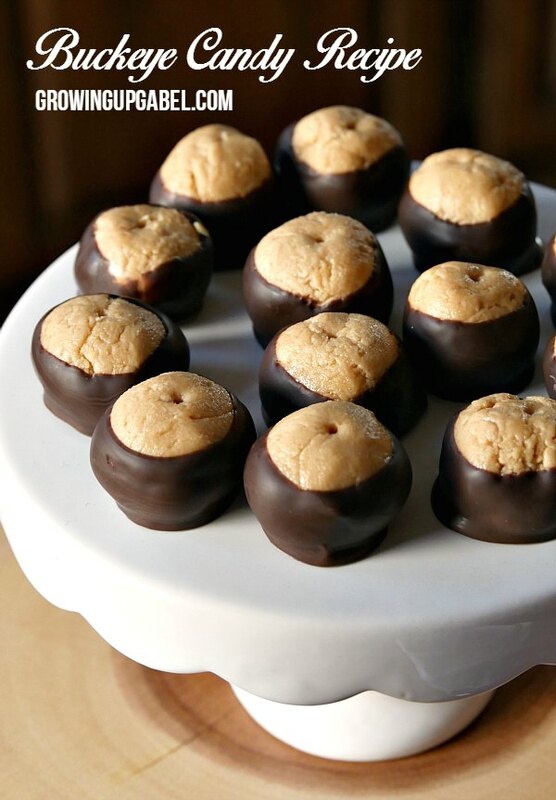 Once the chocolate is completely melted, remove the peanut butter balls from the freezer. Carefully remove the balls, on the wax paper, to the counter. Lay another sheet of wax paper on the cold cookie sheet. Dip the peanut balls about 3/4 of the way in to the chocolate. Roll to allow chocolate to drip off and place the balls on the wax paper on the cookie sheet. The chocolate should set up quickly on the cold balls and cookie sheet, but if it doesn't , put the sheet back in the freezer to allow the chocolate to harden.